Way back when, the only way to get a tattoo you no longer wanted removed from your body forever was to simply have it cut out; that, or have it basically burned off with chemicals. Ooh – or dermabrasion. Any of these sound good? No? We didn’t think so. Rather than using heat to get the job done, the Picosure method uses short, extremely powerful pulses to shatter the ink particles into even smaller pieces than a laser can, so they’re absorbed even faster; whereas Q-switch needs up to 20 sessons to get the job done, Picosure can get rid of your ink in about half that time. It even works on tricky blues and greens! 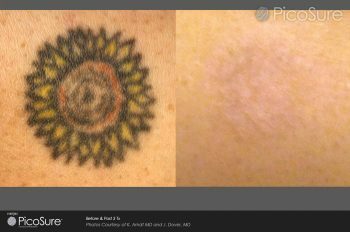 Here at iDreams, we offer Picosure laser treatment to everyone who wishes their tattoo had never happened. Call in for a consultation today and we’ll be happy to help in any way we can.